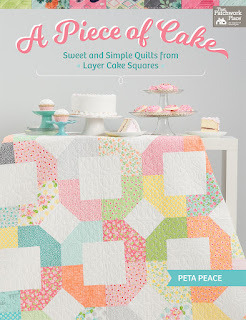 I am taking a break from sewing tiny triangles on tiny squares by the dozens and remembered I had received for review Peta Peace's book A Piece of Cake - Sweet and Simple Quilts from Layer Cake Squares published by Martingale. Oh, what innovative ways she came up with for us to use 10" squares and make beautiful scrappy quilts! Peta's designs are exquisite yet surprisingly simple to construct. Her selection of bright fabrics against the white background (wait, there is a cool aqua background, too!) 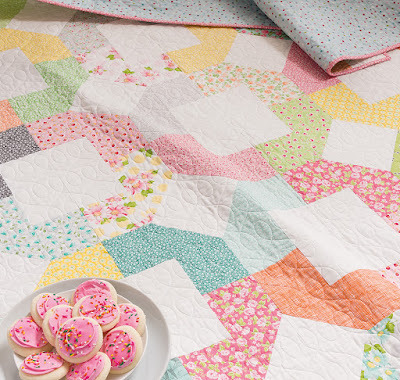 makes the patterns pop, and got me thinking already of which layer cake has been unclaimed in my stash, or what forgotten yardage I could cut up into 10" squares. Modern Spools would look good with any fabric! I would like to make one quilt for each season or holiday, perhaps 2 spools by 2 spools, with the fourth spool toppled over like hers. Let's see: there is Valentines, Easter, Spring, Summer, Halloween, Thanksgiving, Christmas, Christmas, Christmas! Since I am always sewing maybe I should make one for each month of the year. Who would like to Sew Along with me? 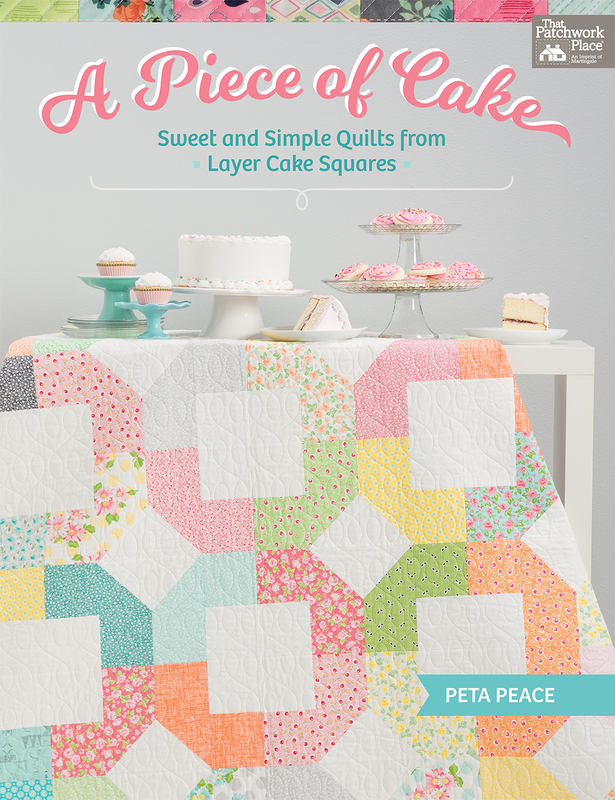 Check out these fun wrapped gift boxes in Peta's quilt Surprise! The blocks are SO EASY to assemble it is too bad I am working on a tight deadline, or I would start raiding my fabric stash for 'gift wraps' immediately! The Simple Sampler is my favorite kind of sampler. One block made with all the different fabrics which come in a Layer Cake. 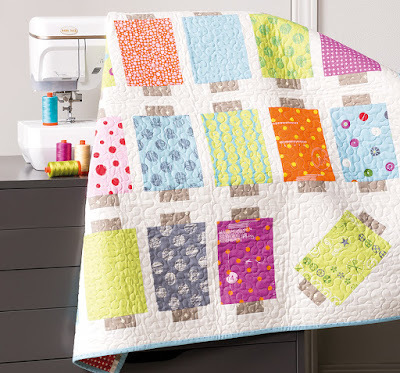 It is a 'fabric' sampler, not a 'block sampler'. Love it! Playing Around Again, the quilt on A Piece of Cake's front cover is gorgeous! It is interesting how my eyes went straight to the center of the 'circles' as if those were the blocks, when in fact the circles are a secondary surprise. Clever! 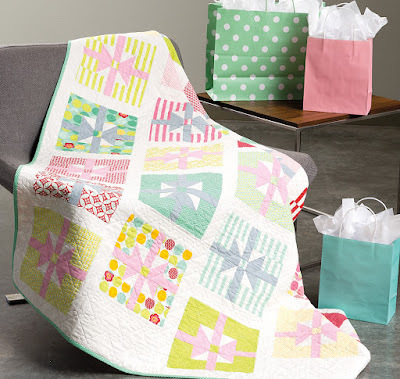 The book has detailed instructions and [colorful] diagrams, as well as a Basic Tools and Techniques and Finishing Your Quilt sections at the end, full of information to make it easy to stitch the blocks and assemble the quilt: add fabric, a little bit of time, your favorite beverage, and you are all set for major sewing fun. Speaking of which, it is time for me to go back to those tiny triangles and squares. I will see you tomorrow! Looks like a wonderful book!!! So pretty, Denise! 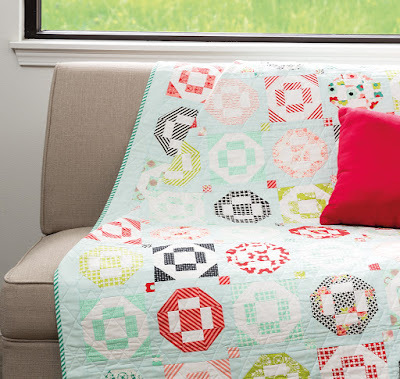 I wish I had the knack for making quilts. They are so beautiful!